If you’re looking for same day builders waste removal in Poplar E14, we’re the people you can trust! We are the first choice for builders waste removal Poplar building contractors and residents can count on for quality, flexibility and convenience. All at competitive prices you’ll love. As fully licenced waste carriers, you can be confident that we’ll ensure that all your Poplar E14 DIY and builders waste is properly and legally disposed of. 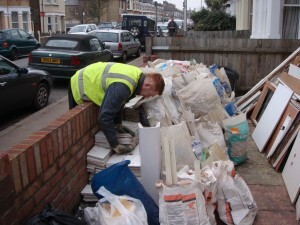 We also work hard to reuse or recycle as much of our customers’ waste as possible, generally around 80%. To get the ball rolling, just give us a call and we’ll give you offer you a convenient, two hour timeslot. An hour before we’re scheduled to come, we’ll call ahead to confirm our ETA so you’re not left dangling. We are happy to offer a free, no obligation quote. Our transparent pricing includes all labour, transportation and disposal fees so you know there won’t be any nasty surprises when the job is done. We’ll even use our own dust sheets when transporting DIY and builders waste through your home, and give the place a good sweep and tidy before we leave too! Want to know more about how we can save you time, money and hassle with builders waste removal Poplar E14? Pick up the phone and give us a ring on 0208 504 7390 or 07957 123019. Or for a quick and easy no obligation estimate, head over to our handy online form, enter your details and we’ll get back to you in a flash.